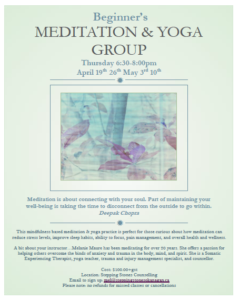 This mindfulness based meditation & yoga practice is perfect for those curious about how meditation can reduce stress levels, improve sleep habits, ability to focus, pain management, and overall health and wellness. 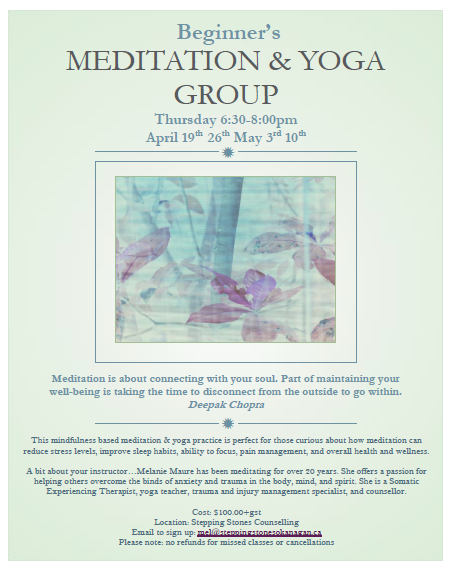 A bit about your instructor…Melanie Maure has been meditating for over 20 years. She offers a passion for helping others overcome the binds of anxiety and trauma in the body, mind, and spirit. She is a Somatic Experiencing Therapist, yoga teacher, trauma and injury management specialist, and counsellor.